It’s the season of gift giving so why not give the gift that will offer advantages for a lifetime? The gift of swimming is a practical yet exciting present to give your children this holiday season. Regardless of the weather outside, learning to swim is an important thing to consider for kids of all ages all year round. Learning to swim creates a wonderful sense of achievement and fosters self-determination. Did you also know that swimming is good for alleviating stress? “I am a strong believer that swimming is truly a gift. Of course, children benefit from the physicality of it, but they also will meet new friends and gain a great social network. It’s easy to instill a love for water, learning and friendships with swim lessons throughout the year,” said Karen Clay, Founder of SwimWest. Swimming in the winter? BRRRR! Relax. At SwimWest we offer a comfortable environment all year round. Our pools are 90 degrees and the air is kept at a tropical 90 degrees as well. There are a lot of happy children of all ages getting ready to jump in the water and learn water safety anytime you come into SwimWest. We keep the class sizes small and encourage students to work their way through the levels of our progressive learning program at a pace comfortable for them. What Should a Parent or Grandparent Expect? When a new family shows up for their first swim lesson, our customer service person will give them a tour of the facility and show them where to change, where to watch their child swim and to shower before and after lessons. What Should a Student Expect? The SwimWest student can look forward to a nice warm pool, a smiling instructor and fun learning techniques at every swim lesson. SwimWest students wear swim caps and some wear goggles in the upper levels during the lessons and we recommend each child wear a stocking cap to and from lessons so they don’t have to wait for their hair to dry or go out with wet hair when they leave the building. 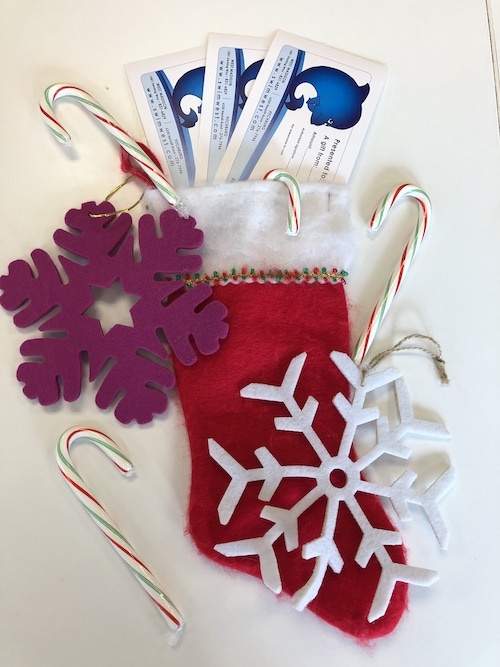 At SwimWest we’re making it easy to give kids the gift of swimming by offering gift certificates, a variety of lesson options and oodles of swim gear to go with it. Check out the Family Swim Pass which has been discounted for the holidays – sure to make a splash with your entire crew this gift giving season! Contact us to learn more about giving the gift of swimming at 608-831-6829 or E-Mail.